I am currently working with a multiple-servers SharePoint Farm (1 Database server, 1 Web Front End server, and 1 Application Server), and I have already installed SQL Server 2014 Reporting Services Add-ins for SharePoint 2013 on the WFE Server and Application Server. 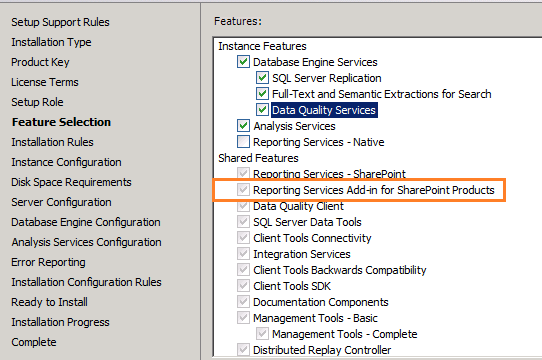 The SQL Server which I've installed on the DB server also already had the Reporting Services Add-ins for SharePoint Products feature activated. I've also already run the PowerShell commands. Installation Error: Could not find SOFTWARE\Microsoft\Microsoft SQL Server\120 registry key. Are there anything wrong with my installation steps? I've tried to google for some solutions, mostly stated that I need to install the RS add-ins on all Application server, which I've already done. You should be aware of downloading and installing Microsoft® SQL Server® 2014 Reporting Services Add-in for Microsoft SharePoint didn't create SOFTWARE\Microsoft\Microsoft SQL Server\120 registry key. Not the answer you're looking for? Browse other questions tagged 2013 sharepoint-enterprise sharepoint-server reporting-services sql-server-2014 or ask your own question.